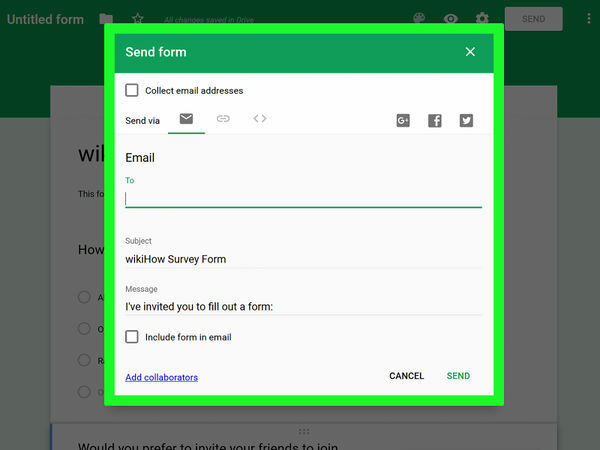 Thanks to Google Drive's "Forms" feature and the relative intuition with which one can use it, you can easily create a Google Form! 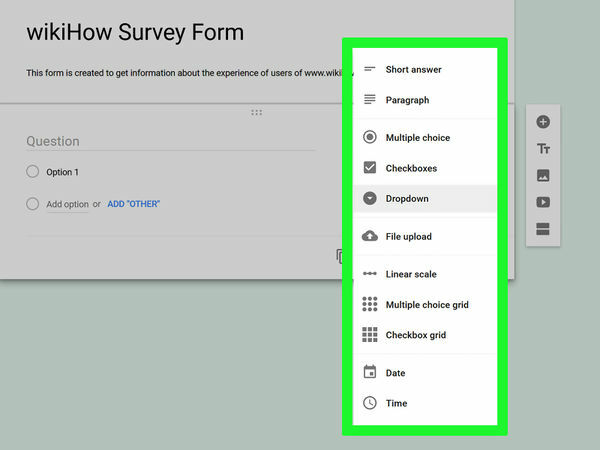 Google Forms can be useful for a wide variety of applications, from data-gathering to event planning. 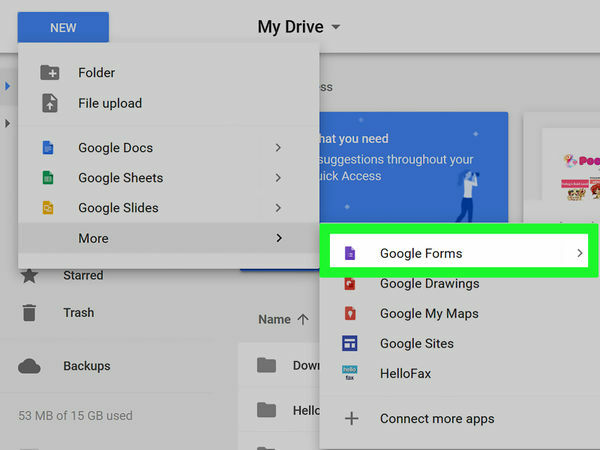 Google Forms are accessible through Google Drive; any created Google Forms will stay in Google Drive. For best results, do this on a computer. You will need to enter your email address and password if you aren't already logged in. 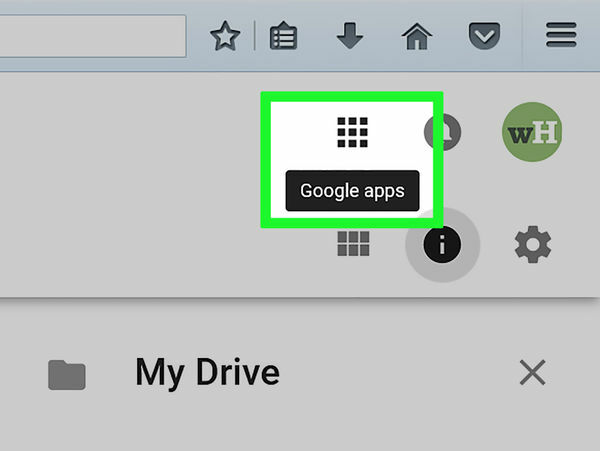 This is the nine-dot grid in the top right corner of your screen, to the left of your Gmail account picture. 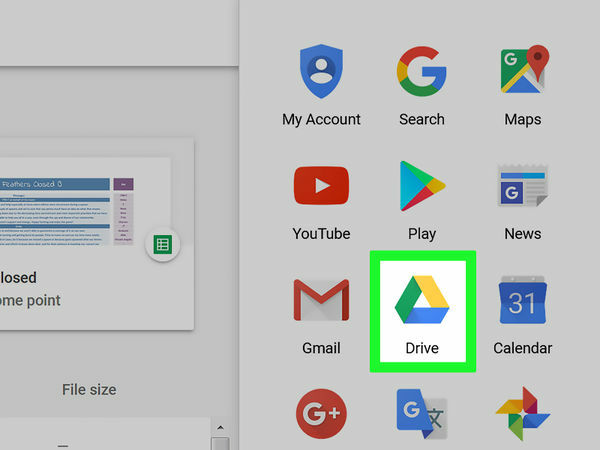 This will open your Google Drive account. Depending on your frequently-used apps, you may see the "Forms" option here. If so, click it to open Google Forms. 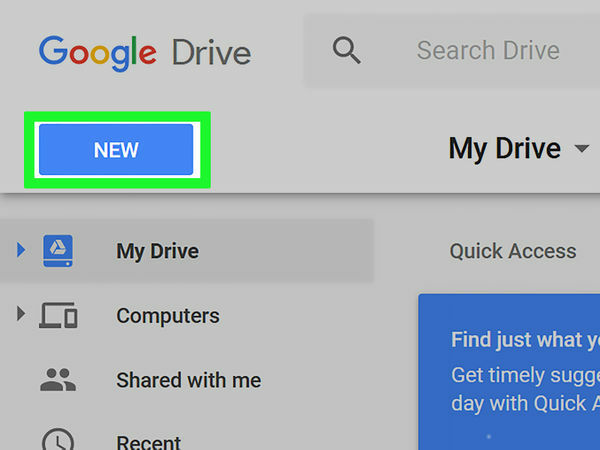 This is on the top left side of your Drive page, right above the "My Drive" option. 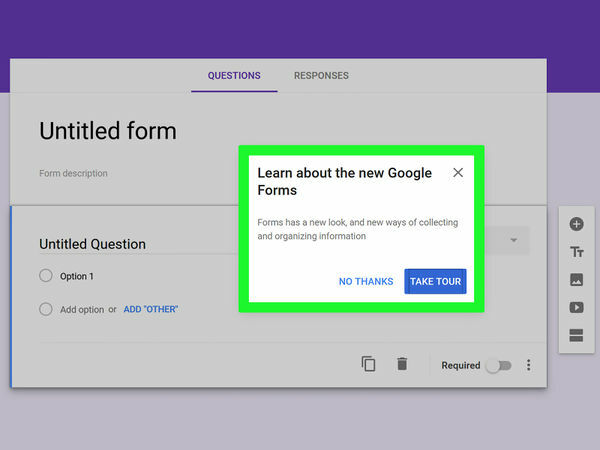 This will open a new, untitled Google Form! 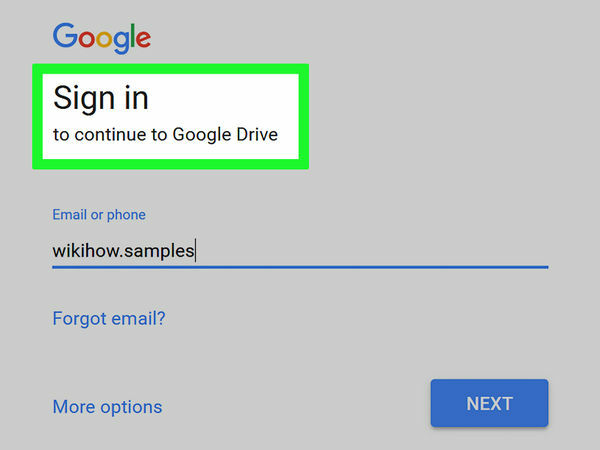 If you need to open a new form from the Google Forms home page, click the "+" button on the left side of the form templates. Knowing what information you need to gather and the purpose it will serve will help you when deciding on formatting, step style, and so on. You can do this by clicking the paintbrush palette icon to the left of the "Send" button, then selecting a color from the drop-down menu. 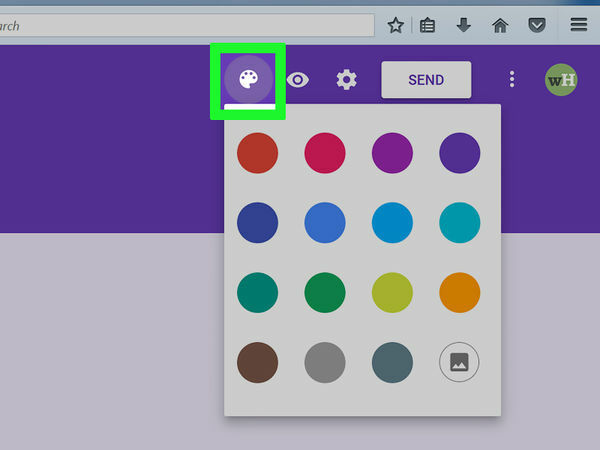 Or, click the image icon next to the colors for a nice theme to use instead of a color. This option is at the top of the screen; you'll need to click the "Untitled Form" or "Form Title" text to type in this field. Your respondents will be able to see this below the form title. Enter this information directly below the title field. Questions are the basis of your data-gathering; users will answer these in whichever style you present the questions. 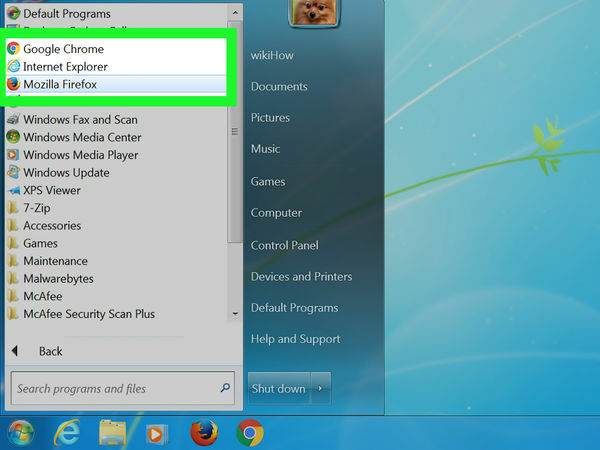 To add a question: Click the "+" icon in the right-hand menu. Type your question text into the "Question" field. Replace the "Option 1" text with an answer. 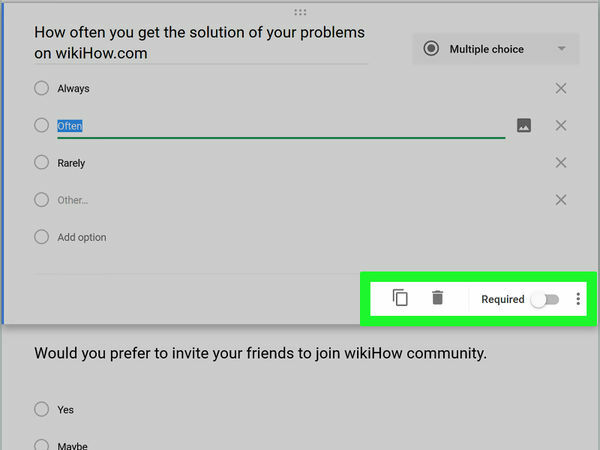 Tap the "Required" switch in the bottom-right corner for mandatory questions. You have several ways in which you can display your questions. To change your type of question: Click anywhere on a question card. Click the drop-down menu to the right of the question text. Select "Multiple Choice", "Checkboxes", or "Drop-Down". You can also choose longer answers like "Short answer" or "Paragraph". You can do this by clicking the grid of six dots at the top of a card, then dragging it up or down and releasing it in its new location. 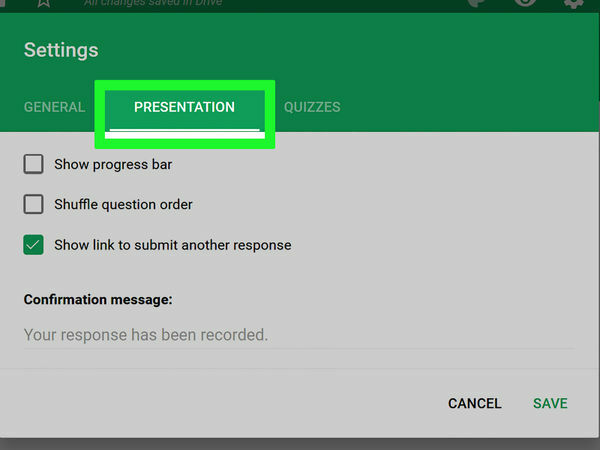 You can perform a couple of different actions on your question cards: Click the "Duplicate" button (two overlapping cards) to duplicate your current question card. Click the trash can icon to delete your current question card. Click the portrait icon next to an answer. This will allow you to add a photo; you'll need to hover over the question for this option to appear. 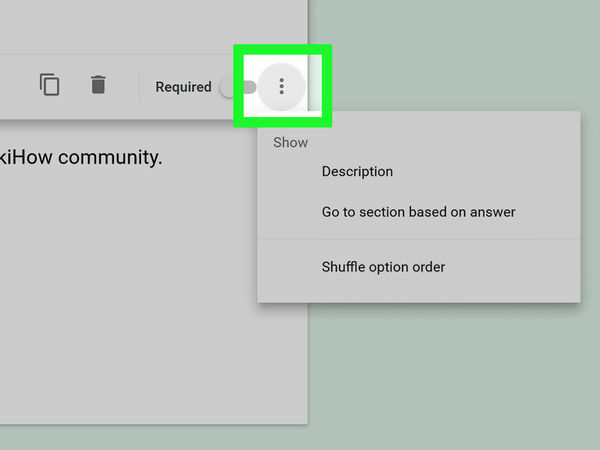 You can do this by clicking the three vertical dots in the bottom right corner of your current question card: "Description" - Add a clarifying description to your question card. "Go to section based on answer" - Link different question cards to different answers. You'll do this from drop-down menus next to each answer on a card. "Shuffle option order" - Shuffle the answers for your current card. 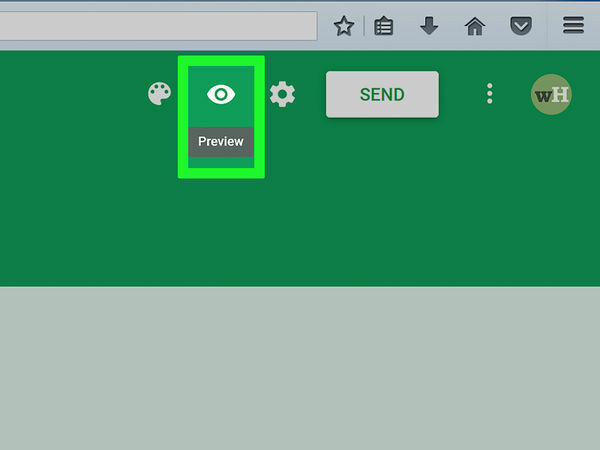 This is the eye-shaped icon in the top right screen toolbar. When you're done reading through your Form and making sure all of the formatting is correct, you'll be ready to distribute your Form! You can do this by clicking on the gear icon in the top right corner of the screen. 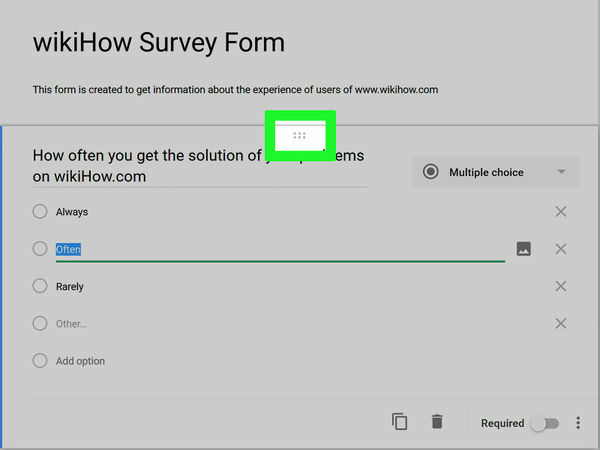 Your form settings menu includes the following criteria: "Requires Sign-In" - Require respondents to sign into Google rather than being anonymous. Click the "Limit to 1 response" to enable this feature. "Respondents can..." - "Edit after submit" and "see summary charts and text responses" are your options here. 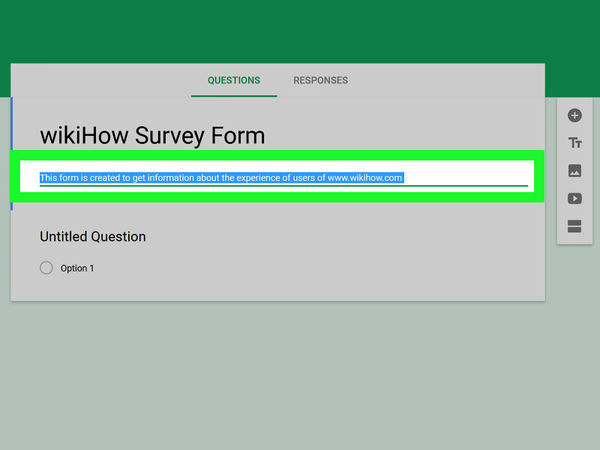 These let respondents change their answers and view form results after submitting. These are also in the settings menu; switch from "General" to "Presentation" by clicking the pertinent option at the top of the settings window. 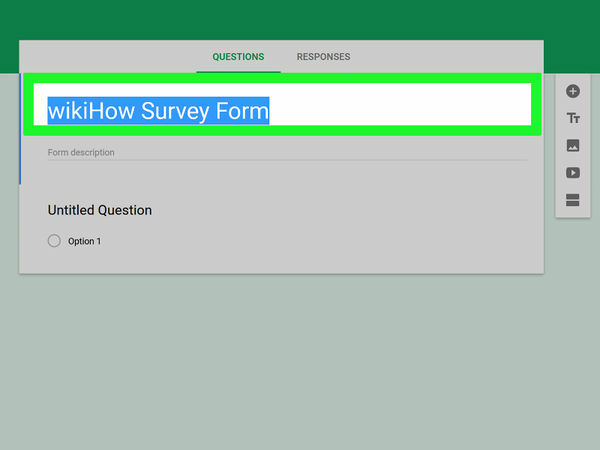 "Show progress bar" - Displays a metric that tells respondents how close they are to completing the form. "Shuffle question order" - Varies the question order from user to user. "Show link to submit another response" - Creates a link to re-complete the form. This is ideal for invoicing forms. 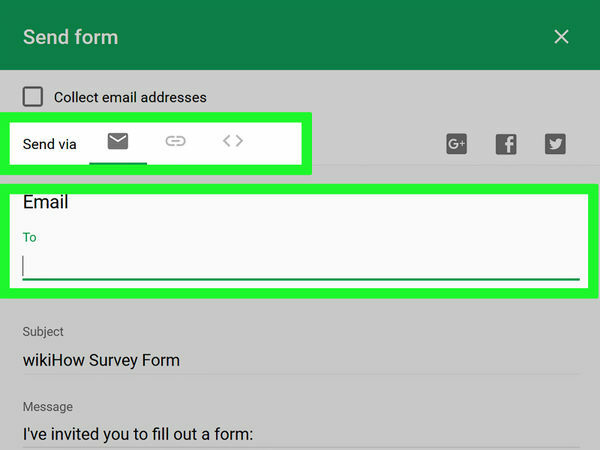 "Confirmation message" - Customize your form's completion message by typing your preferred message into the field below this text. 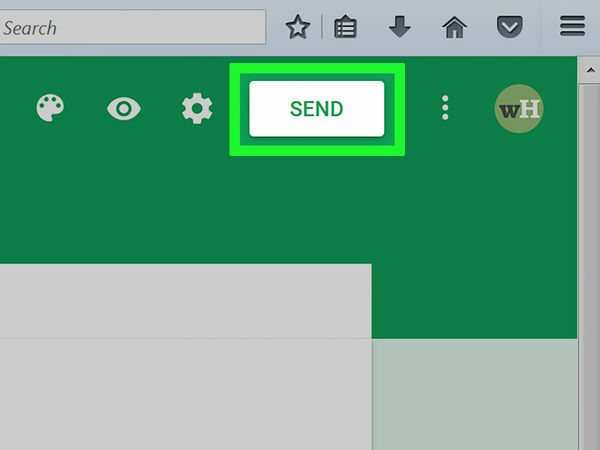 This is in the top right corner of your screen; clicking "Send" will bring up a "Send form" menu with several different sharing options through which you can cycle from the top of the window. Depending on your form's purpose, your preferred option will vary: Email - Choose this option to send an email to your contacts directly from the Forms site. 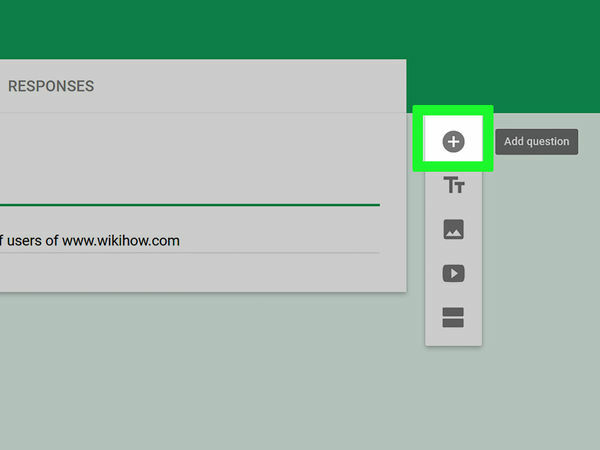 Link - Choose this option to get a link to copy-and-paste. Embed HTML - Only use this option if you're placing this form directly on your website. 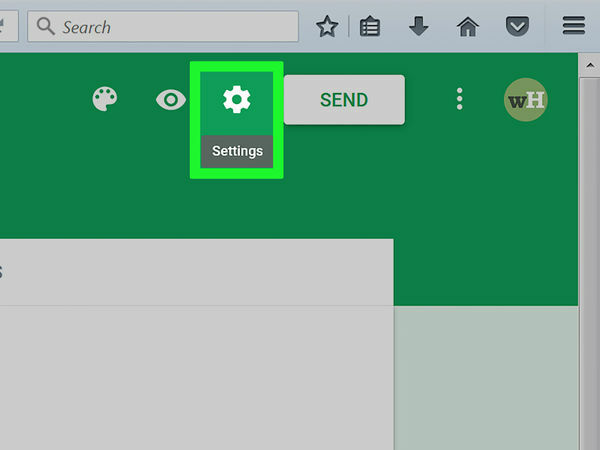 Google+, Facebook, or Twitter - These are quick-share options in the top right corner of your "Send form" menu. Since you have a few different options for doing so, your process will vary: Email - Add a contact to the "To" field, a subject to the "Subject" field, and a brief message to the "Message" field. 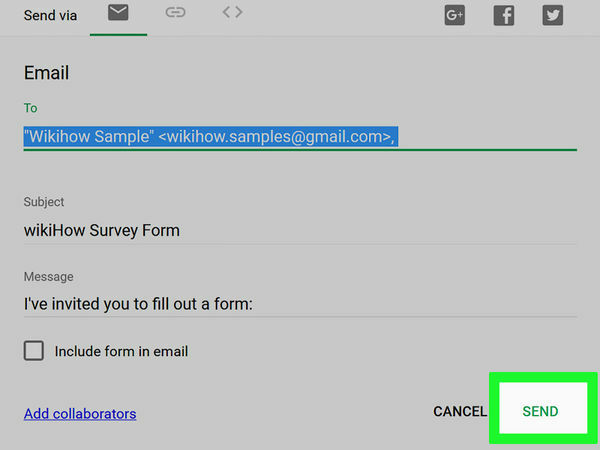 Click the "Include form in email" option to embed your form directly into the email. Link - Right-click (or two-finger click) the link field and select "Copy". You can then paste this link in an email or on your preferred social media site. Embed - Right-click (or two-finger click) the HTML field and select "Copy". You can then paste this text into your website's HTML processor. Note that you can edit the width and height values of the form from here. This will distribute your form to everyone in the form contact list! To distribute the form via link, you'll need to manually post the link on a social media site or into an email.